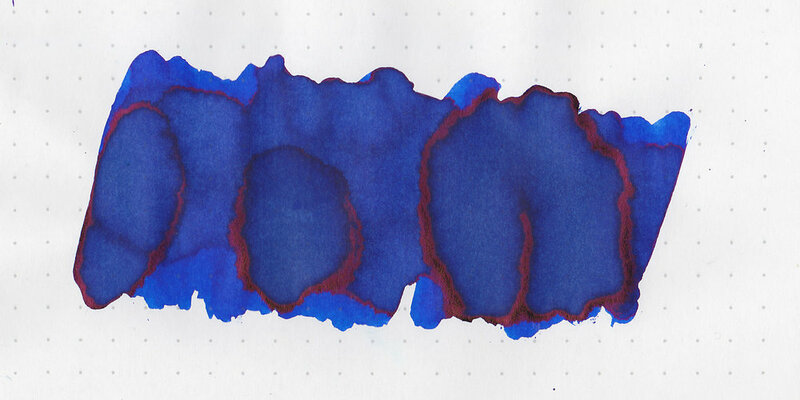 Parker Penman Sapphire is one of those inks that I hear about all the time. Many consider it to be a grail ink. It was only produced from 1993-2000, so there are only so many bottles out there. Currently, a new bottle of ink goes for $100-150 on eBay. I’ve always wanted to give it a try, and a pen friend sent me a sample recently so I try it out. I like reviewing discontinued inks so I can try to find a current alternative. Let’s take a look! Sapphire is a beautiful bright medium blue. In large swabs the ink has some pretty sheen, a coppery red. Other properties: high shading, high sheen, and no shimmer. I saw some shading in all nib sizes on all papers and sheen in all nib sizes on Tomoe as well as three nib sizes on the other papers. On Staples 24 lb copy paper there was a lot of feathering and bleeding. Sapphire is right in-between Monteverde Sapphire and Monteverde Ocean Noir. Diamine Skull and Roses is also similar, but it has more sheen than Sapphire does. I used a Kaweco Al-sport Rose Gold with a broad nib on Tomoe River paper. The ink had an average flow, but I did have a clog and some hard starts. Overall, it’s a gorgeous color, really, it’s amazing. The color isn’t so amazing that I can overlook the performance though. There was feathering, bleeding, hard starts, and some clogging. If I want this color blue I would reach for Monteverde Sapphire or Monteverde Ocean Noir.